It’s been a little over a year since WhatsApp released its web version, Web.WhatsApp; and only half a year since WhatsApp Web became available for iPhone. In today’s ever-changing world, that may seem like a long time, especially in “tech years” (akin to “dog years” but much more closely tabulated like “mayfly years“). But maybe you haven’t had need for WhatsApp’s web version, or you haven’t had access to it, yet. Whatever your reasons, you want to know more and have landed here. We’ve talked about WhatsApp before — whether that’s downloading a version that you can use on your PC, or just plumbing the depths of all the emoji that are available on the app. So, today, we’re gonna break down the Web.WhatsApp Messenger. Whether you’re on a PC, laptop, Mac, iPad, Android tablet, iPhone, Android phone, or Blackberry… just kidding on that one (more on that later), we will discuss all things WhatsApp Web and bring you the latest in WhatsApp news and updates. Because with an app that is considered “essential” in the eyes of The App Store and boasts 1 billion users, we want you, our dear reader, to be on the up and up! The very latest news out of the WhatsApp world is the addition of text formatting! This is an exciting new feature! WYSIWYG (what you see is what you get) formatting has become such a ubiquitous part of our digital interactions, it shows up in most email clients and all word processors, that italicizing or bolding something for emphasis is part of our instincts now. But with no manageable way to do this in most text messaging clients, people who want to add a little emphasis (or else, those really pedantic friends of yours who insist on formatting movie titles appropriately in even the most informal communications) had no recourse except for resorting to ALL CAPS. Which is generally understood to be a visualization of someone shouting. So instead of giving a little discreet emphasis to this idea or that, you look like you just have poor volume control at random moments. But now these options are available. They use a lot of the same shortcuts that were common in word processors (often web-based) before Ctrl + [Key] was a universally incorporated key combo. In a nutshell, you adjust the typeface of your word or phrase by flanking it in matched symbols of your choice: To put words in bold, you add asterisks (*word*) on either side of the word (or the phrase. So *All your base are belong to us* instead of *All*your*base*are*really*this*is*an*old*meme*and*I*should*be*ashamed*of*myself*for*bringing*it*back). For italics, you type an underscore on either side (_word_). I this is an interesting choice, because in a lot of those old word processors I was talking about earlier, slashes (/) were the go-to for this. But maybe slashes were avoided because of their ubiquity in URL protocols. And when you use a tilde on either side (~word~), you’ll get a strike thru. You may be wondering why there’s no option for underlining, but in this post-word processing age, I think it’s safe to say that italics have more or less replaced underlines. But which ever way you slice it: Woot! More choices for better and clearer communication via text messaging! This feature is currently only available for iOS and Android. But the two are interchangeable, and nobody has any strong opinions on them one way or the other. This update also includes a Quick Reply feature, in which you can respond directly from your notifications, as well as more wallpaper options and new multiple selection tools (mark group chats as unread, mute, etc.). But it’s not all good news: One of the frowny-face emoji -est pieces of news in the world of WhatsApp is the app’s decision (or rather, the decision of Facebook, which is now the company that owns WhatsApp) to cut ties with Blackberry. WhatsApp, Facebook and Facebook Messenger will not be supported on Blackberry 10, the latest of the struggling company’s operating systems. One the one hand, Blackberry has always sort of been geared toward corporate users (most people who rate a company cell phone end up with the functional Blackberry), so maybe the lack of social media support won’t do the phones in. On the other hand, social media presence has become an assumed part of any business, so this probably won’t be the non-decision that it used to be, and it might still cut BlackBerry out at a few offices. Plus, Blackberry users will still have access to Android apps via the Amazon App Store… yeah, I never thought I would write a sentence that included the words blackberry, android, and Amazon outside of my fruit-eating robot spy kids novel set in French Guiana. But I stand corrected. To download the latest version of WhatsApp, click here. You’ll need it anyway, in order to run WhatsApp Web. WhatsApp Web is a means of using your computer, instead of your phone, in order to send and receive messages on WhatsApp. Now, I say “instead of your phone,” but your phone is still an important part of it. Basically, the browser based WhatsApp Web is in communication with your phone, and your phone is still doing all the heavy lifting. So you can’t use WhatsApp Web unless the phone you use WhatsApp with is nearby, on, charged, and with an internet connection. This may be a bit cumbersome to a lot of people, but on the plus side, it makes it a lot harder for someone to spoof your account if you happen to stay logged in on a computer. However, since your phone will be engaged (but not the primary thing you’re engaging with) you’ll need to be mindful of your internet connection. Be connected to Wifi. If not, it’s easy to forget that your phone is using its data connection (since you’re primarily working with your computer—so you think of you computer as the thing that’s online instead of your phone). This could eat up your data plan pretty easily, depending on how much time you spend on WhatsApp, and if you’re the sort of person who sends a lot of media. Safari — this is the browser that comes bundled with OS X. Edge — This is the browser that comes bundled on Windows 10. This is what they’ve replaced Internet Explorer with. I’ve not had a chance to work with this myself, so I don’t know — is this significantly better than Internet Explorer? Or is it just the same bag of crap with different tassels? As for the mobile device, I listed above the various devices you can use. If you want to use WhatsApp on your iPad instead, I’m afraid you’re out of luck. WhatsApp isn’t supported on iPad, or in any other tablet form. There are a number of third-party apps that will let you access features of your WhatsApp account from them. Be careful about using them, though, because social media security can be spotty enough — when you add an additional app that you’re essentially giving full access to your profile and posting, you’re just increasing those vulnerabilities. Once you’ve got everything you need, just fire up WhatsApp Messenger on your phone. Meanwhile, point the browser of your choice over to this site over here. That’s the WhatsApp Web portal. When you first bring it up, you will be looking at a QR code. 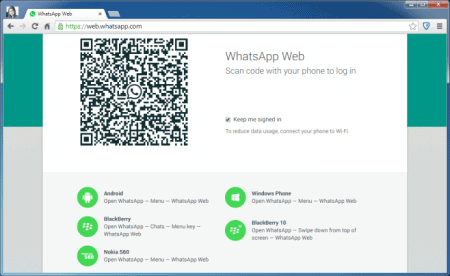 You simply need to read the QR code on the screen with your WhatsApp… app. 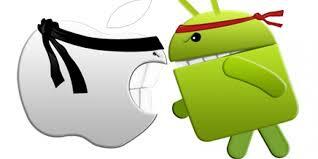 This will put the two devices into conversation with each other. Now, when you bring up this QR screen, look for a small checkbox near the code itself. By checking this box, you can have the computer “remember” you, so you don’t need to go through this process every time you want to use the WhatsApp Web portal. And that’s it. Your device is now linked to your computer, and you can send and receive messages, start new conversations, and perform a variety of other WhatsApp functions right from the comfort of your own browser. This means you can keep it running in the background while you work on something else, and you don’t have to keep referring to your phone every two minutes. Your phone can stay in your pocket. But don’t forget that your phone is still using data, so just as I said earlier, you’ll probably want to have your WiFi on. So that, in a nutshell, is how to use WhatsApp Web messenger. How did we do? Did we forget to cover something important? Share your own experiences using the WhatsApp Web Messenger down in the comments!